You may think you're strong with a wrench, but a socket wrench can twist the head of a bolt right off. The ratcheting wrench makes tightening and removing bolts incredibly easy. 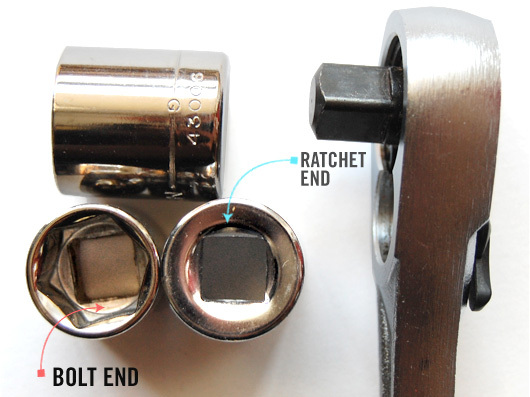 Know your ratchets, sockets, and accessories. A socket wrench is most commonly a handle with a 90 degree ratchet, along with a set of cylinder shaped “sockets” of various sizes. The sockets fit onto the ratchet by way of a square nub. You can set the ratchet to either tighten or loosen, then keep the socket in place on the nut while you turn the handle. It’s that simple. A ratchet is a type of gear mechanism that holds when going one direction, and releases when going the other direction. 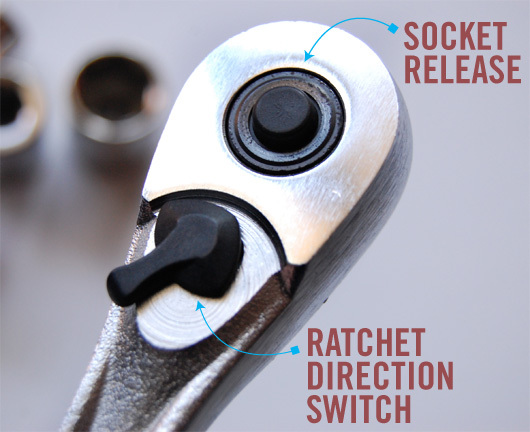 A socket wrench isn’t the only type of ratchet. You can also get ratcheting screwdrivers (which can help minimize wear on screw heads) and T-handled ratchets (for a middle ground of torque between a screwdriver handle and a wrench handle). You can also get a personal valet to bathe you and butter your toast, but for now, let’s avoid any frivolous purchases for now: the socket wrench should be the only ratcheting tool you’ll really need. Socket wrench sets also come in either SAE or Metric sizes. Fortunately, here in the US, the ratchet handle is standardized to fit both. 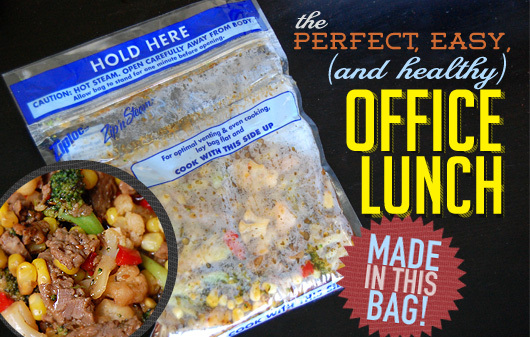 The square nub is typically 1/2”. Small ratchets use a 1/4” nub (and most sets come with an adapter that goes from 1/2” to 1/4” for the smaller jobs). An extra large ratchet uses a 3/4” nub, but these are very rare, unless you work on airplanes or live on the planet Hoth. Most socket sets also come with a couple of extenders, that help you get your wrench into deep places, like spark plugs in an engine block. 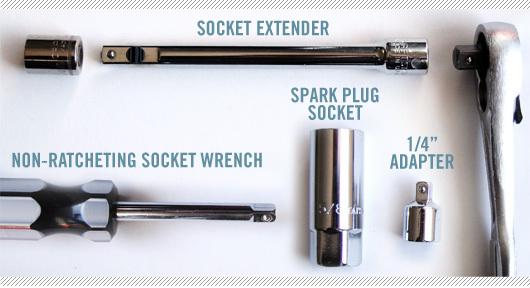 When you hear the term “spark plug wrench” you should visualize a type of socket. The spark plug socket is a longer cylinder, designed to fit a spark plug. On most cars, you will need either a 5/8” or 13/16”, but check for yourself or read your car’s manual before spending money. 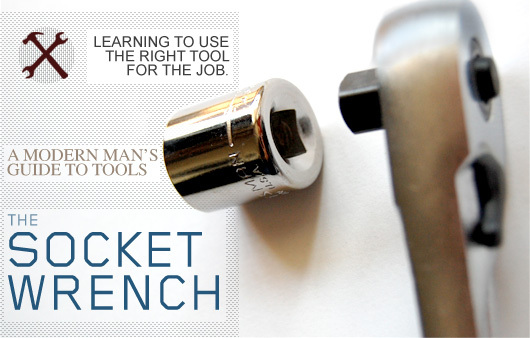 The same essential techniques and pitfalls for any wrench apply to the socket wrench: use the right size. Do keep in mind that a ratchet can be very powerful — and by design it holds in place better than other wrenches. It’s possible to twist the head right off of some bolts. As previously mentioned, if the nut or bolt is super tight, lube it up with some Liquid Wrench or silicone spray. Before birth, Jesse's mother decided that Jesse Stern was a great name for a writer or musician. He now lives as a touring and studio musician in Los Angeles California. He also has an 80's tribute band, The Young Guns. He plans to wait until 40 to write his first novel. 3/8″ drive is more standard than 1/2″. Your pictures show 3/8″ sockets. Another important thing to remember is to apply counter-torque if you’re working with an extension, otherwise you run an increased risk of rounding off the fastener when the socket slips free, or smashing your knuckles. Also, a breaker bar or combination wrench is a better choice for freeing stuck fasteners – I’ve seen several ratchets get blown up trying to break something free. 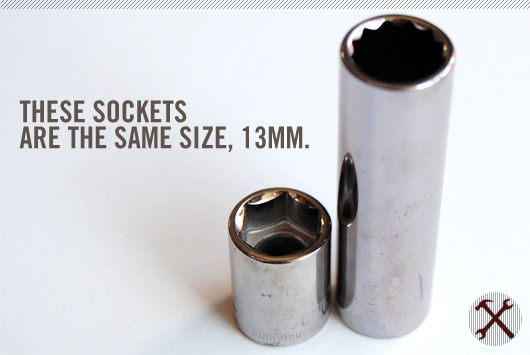 A socket wrench may be a ratchet tool that comes with a group of cylinder-shaped sockets of varying sizes. People use the tool sets uk for adjustment and loosening loco or bolts of completely different sizes. Socket wrench sets are useful styles of instrumentality to possess round the house for repairs and comes of all types. Users should apprehend however the various components of the set work, what factors to consider, and know however to spot that components to use sure as shooting comes. I have a space in my socket set the size of 22mm socket but it says 3 way socket? and its missing but what does it look like and what’s it for?